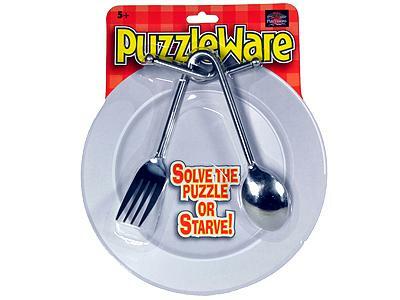 This is a traditional puzzle, but given a new twist!The fork and spoon are linked, and in order to use them, you have to solve the puzzle. As the blurb says - 'solve the puzzle or starve! 'This is not an overly complicated puzzle, but it is certainly a bit of fun. The fork and spoon, which are made of metal, can be used for eating in the regular way, once you have separated them! Cutlery of mass frustration! The Spoon & Fork should have been genuine. They look like puzzle mockups which spoil the effect when put in a place setting on the dinner table. Have had LOTS of fun putting these out at dinner parties - No dessert till you've solved them! A good puzzle to have some fun with friends.